Posted on April 11, 2019. Filed under Members News, Special Features. Be the first to comment. 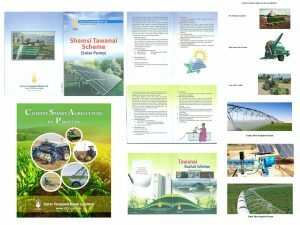 The welfare of the farming community is essential to Zarai Taraqiati Bank Limited (ZTBL) and hence it launched the Green Banking Initiatives in accordance with the guidelines set by the State Bank of Pakistan to mitigate climate change impact to the environment, especially to the agriculture sector which it serves. Under this initiative, ZTBL aims to strengthen its role in the country’s agriculture sector in the face of a changing climate reality by providing soft term credit facilities to the farming community as well as imparting agri-related capacity-building training programs to farmers. In addition, the Bank has developed and launched additional green products like “Shamsi Tawanai Scheme (Solar Powered Water Pumping System), Tawanai Bachat Schemes (Bio-Gas Units) to provide an alternate energy source, farm forestry/plantation of trees and nurseries, and promotion of soybean cultivation. The Bank’s Green Banking Initiative will serve to shift the development pathway toward a more climate resilient direction by putting an impact on environment through the reduction of GHG, using drought-tolerant varieties to sustainably increase productivity and resilience of crops, capacity-building of farmers through training, integration of organic fertilizers, and rotating crops with legumes thus ensuring food security and soil fertility. The initiatives taken by the Bank will bring a positive impact on the overall environment as well as would mitigate environmental risks to a greater extent. ZTBL’s “Green Banking Initiative” won the 2019 ADFIAP Development Project Awards under the environmental development category.